I asked my boys for their input when I was selecting seeds for our garden in early spring. My older boy wanted carrots. 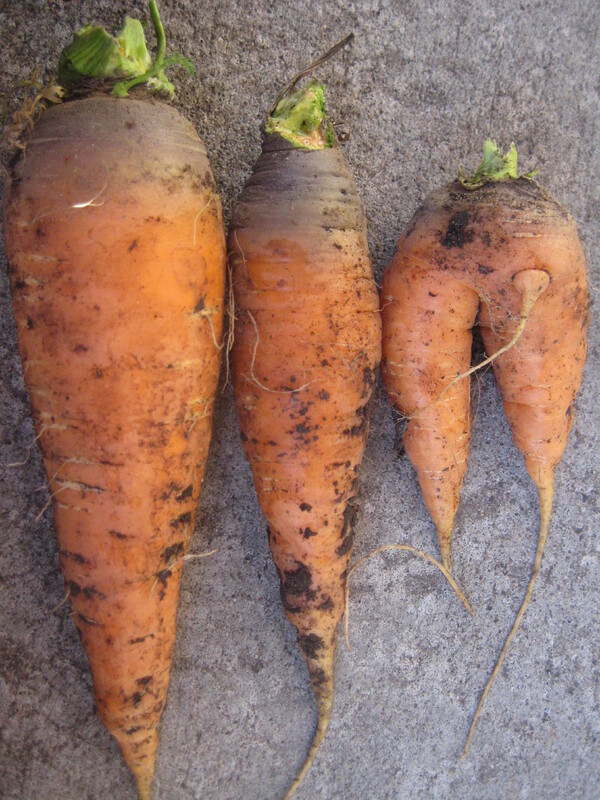 Carrots seemed like a waste of precious garden space to me. I tried to talk him into something more interesting, but he didn’t waver. Carrots are his favorite vegetable. Raw only, thank you very much. So we planted a short row of carrots. Our very prolific lemon cucumber vines almost covered them up, but we did have carrots to dig in late October. Of the eleven books we checked out that week, my preschooler asked for this one to be reread the most. 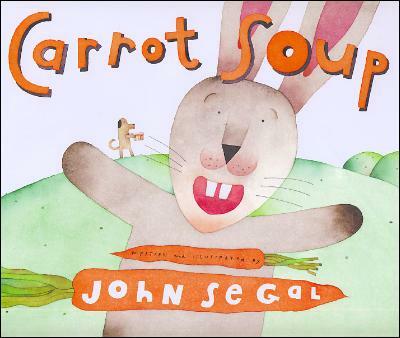 On the last page, there’s a recipe for rabbit’s favorite carrot soup. So we made a half a batch one day. You know that theory about having your kids involved in growing and cooking their food? It seems to hold true somewhat – they do tend to be willing to try new things when they’re involved in the decision making process. Both boys ate a small serving of the soup. The older boy even asked for seconds. And he suggested I write the recipe down before we turn the book in. It’s April and in good Minnesota fashion, three out of five days this week are expected to involve snow. But, according to the good people at Gardening Matters, this does not have to interfere with spring planting. With six weeks till frost free weather (God willing), it’s time to get seedlings started. We’re trying a method from wintersown.org. We made our own mini greenhouses using empty milk jugs. It’s a simple and fun process. My kids and I think you should try it. 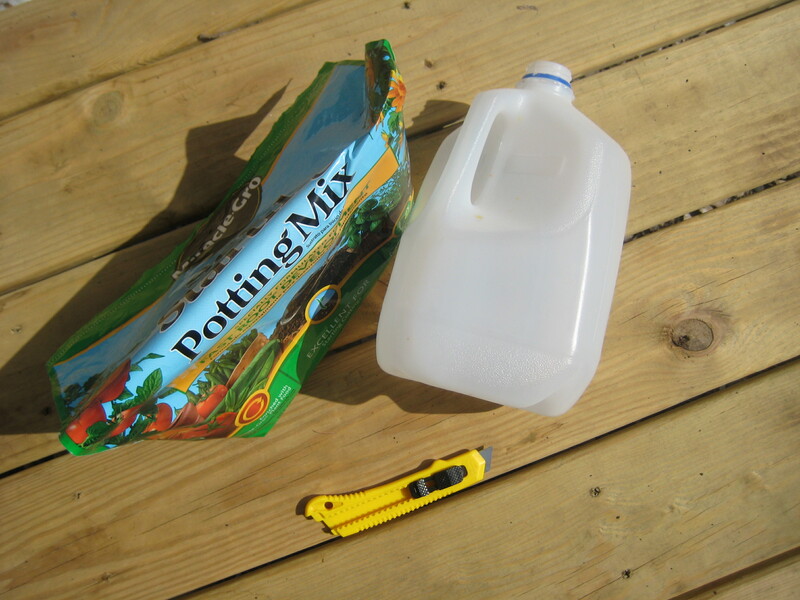 Using a utility knife, cut a horizontal line about four inches from the bottom of each jug. Just cut around three sides of the jug. Leave the fourth side uncut so it can function like a hinge. Then cut at least four slits in the bottom to allow water to drain out. 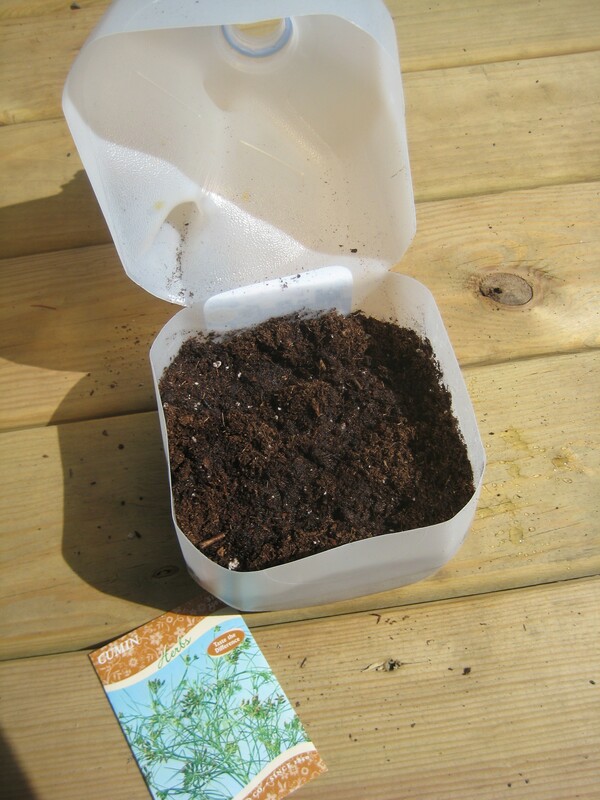 Add soil to the container, leaving about an inch of room at the top. Sprinkle the soil generously with water. Sow seeds, spacing them as recommended on the package. Cover the seeds with a thin layer of soil. Flip the top of the jug back into place. Tape the container closed with clear tape. Label each so you remember what is growing where. Leave the lids off. Place the jugs on the east, west or south side of your house. And here’s the reassuring part for those of us in northern climates: allow snow to pile on top. As it melts, it will add moisture to the soil. 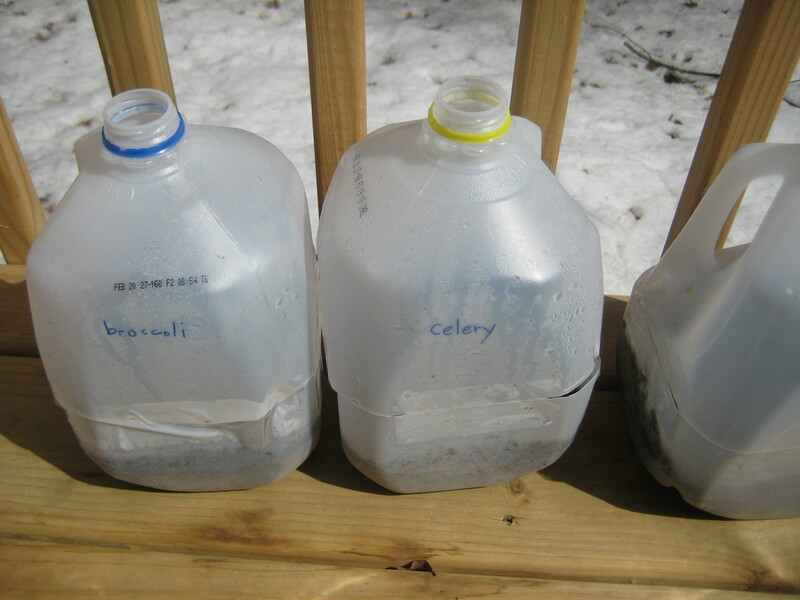 If the containers do not have snow on top and there’s no condensation, then water the seedlings to keep them growing. So far we’ve planted broccoli, celery and cumin. Once we get another empty milk jug, we’re going to plant some spinach too. Sometimes you have a such a lovely summer day, with so many of the elements of what you like about summer all in close succession. You wish the day would last longer. Or that you could relive it all tomorrow. We started by watering our community garden plot and picking two cucumbers and nine red tomatoes, some of which we ate for lunch and dinner. My boys also picked and ate all the ripe cherry tomatoes, and then picked and ate all the nearly ripe cherry tomatoes. Our younger son even tried the totally green ones, only to discover that those are better left on the vine for now. We splashed in the water for an hour or so at a regional park and dried off on their playground. My boys’ lean, bronzed bodies have never looked handsomer. As a mom, it’s a joy to watch them grow in confidence and stature. Relaxed by the water and tired from the sun, we hid indoors for the hottest part of the day. A bright pink sunset signaled the end of the day. When I went for my evening walk, two foxes scampered across the road in front of me. The second stopped for a moment. He stared at me and I stared back at him. But today was for thinking about what’s ahead. This morning I took my older son to kindergarten registration. No reliving his preschool years – or trying to make them last a little longer. We’re moving on to a new era, an era where he’ll be speaking for himself and I won’t even be within ear shot. Once we entered the school a teacher whisked my son off to a classroom for a short assessment of school readiness. I stayed in the hallway to fill out a stack of papers. So he is capable of speaking for himself. It’s just this mom who’s got lots to learn about letting go. Yesterday the boys and I cheered upon discovering that our tomato seedlings had started poking through the potting soil. They’re heirloom seeds, collected from the drippings of some particularly sweet, juicy tomatoes our neighbor shared with us last year. I simply poured the extra liquid off the plate that held the tomato slices and allowed the remaining seeds to dry right there. After I had done so, I came across some rather involved directions about soaking and washing and drying heirloom tomato seeds prior to storing them for the winter. My seeds were already safely sealed in an envelope, labeled and waiting for spring, but then I wondered then whether they’d grow or not. I’d only know if I gave them a chance. Just over a week ago, we filled some disposable cups with fresh soilless potting mix and put three to four seeds in each cup, and covered them with more potting mix. Actually, I did all the work in the laundry room, out of reach of “helping” hands. Perhaps it was not as much of a learning experience for them, but gave several opportunities to see the planting in progress. (In the tension between “learning by doing” and mess prevention, learning often prevails, but I do have my lazy moments.) Their chance to play in the dirt will come – when it can be done outdoors. Now the goal is to keep these tomato plants alive indoors for five more weeks. Last year, I failed miserably. Old potting soil and/or over-watering left me with no seedlings that made it as far as the garden. This year I’m thinking about providing some supplemental lighting to prevent them from becoming too spindly. Any other advice for ensuring our seedlings thrive? With an early start to spring this year, I’ve stoked the compost bin already, mixing in dry leaves to get it back to a ratio of approximately two parts “brown” or dried material (leaves, in our case) to one part “green” (fruit and vegetable scraps from the kitchen). During the winter I added kitchen scraps to the bin whenever our small indoor bucket was full but only tossed in a layer of leaves when the leaf pile wasn’t covered with snow. Some larger masses of fruit and vegetable scraps froze all together. Once it all thawed, I was able to mix in more leaves. Now the contents of the bin are just wet enough to squeeze a drop or two of water out, which is the moisture level you want for optimal composting. I’ve noticed the composting microorganisms are now hard at work, generating heat in the process. The boys have been poking around in the compost too. Composting is a great way to introduce the concept of the earth’s recycling system while reducing the amount of solid waste that has to be hauled from our home. There are resources specifically for teaching children about composting, but for preschoolers, modeling is the primary method of instruction, I’d say (like so many other aspects of parenting). This activity allows you to introduce some science vocabulary too, such as the terms decay and decompose. If you want to try it out, I’d suggest starting with a simple bin made from a trash can. 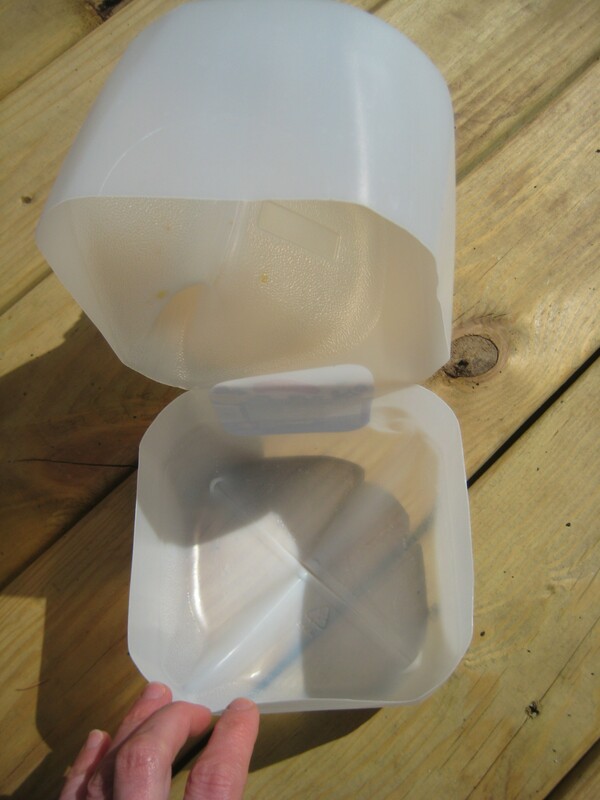 The lid keeps the pests out – usually. We have two bins that we rotate, which is just right for handling all the kitchen waste for our family of four. When one is full, we let it compost while we fill the other. If one bin is empty, it’s easy to turn the compost by transferring it all from one bin to the other. Put a layer of dried leaves on the bottom, a thin layer of fruit and/or vegetable scraps, and then another layer of leaves. You can toss in a bit of dirt if you like, but it’s really not necessary, I’ve found. We just keep adding to to the bin whenever we have more scraps, mixing after each addition, until it is full. Once all the discernible bits of plant matter have been composted, you’ve got a dark, rich hummus that makes an excellent mulch or soil amendment. The University of Missouri Extension provides additional guidance on making and using compost. The fresh cilantro added to last night’s spaghetti and tonight’s curry, picked just minutes before dinner, adds more flavor than store-bought ever did, it seems. The Dinner Garden is a new non-profit that’s championing gardening as a solution to hunger. They accept donations of unused seeds and pass them along to individuals who can use them. Ed Hume Seeds’ “Plant a Row for the Hungry” program gives a free packet of seeds to people who wish to donate garden produce to a food bank or soup kitchen. One of the news stories I heard a couple of times yesterday was about ground breaking for the Obama’s vegetable garden. It was noted that Michelle Obama was even intending to have the garden-fresh produce served at the White House. Is this the case of an idea so old that it seems novel once again?